A link to a questionnaire completed by Democratic candidate Harley Rouda that showed his support for ‘Medicare for All' and reparations for slavery has been scrubbed from the website of a far-left group. Rouda, who is running in California's toss-up 48th congressional district against incumbent Rep. Dana Rohrabacher (R.), answered the questionnaire for the Progressive Democrats of America, which is used to determine whether a candidate receives the group's endorsement. If candidates answer "yes" to a question—and wins their election—they are pledging to immediately co-sponsor reintroduced legislation in the 116th Congress on bills that include: Establishing an Oversight Commission on Presidential Capacity; an expanded and improved ‘Medicare for All' Act; Department of Peacebuilding Act of 2017; Automatic Voter Registration Act; Raise the Wage Act; Jobs for All Act; and the Commission to Study Reparation Proposals for African Americans Act, among others. Rouda answered "yes" to every question on the form, signaling that he supports the likes of Medicare for all, reparations for slavery, and the creation of a Department of Peacebuilding if elected. Rouda also previously said that he backs expanding Medicaid to illegal immigrants at a liberal forum during the Democratic primaries but recently claimed that he never made that statement despite it being captured on video. Rep. Rohrabacher's campaign on Wednesday sent an email drawing attention to Rouda's questionnaire that was posted on the group's website next to his name. Hours later, the link to Rouda's document was removed. However, Rouda's questionnaire was saved and can be viewed here. The Progressive Democrats of America did not respond to a request for comment on the questionnaire's removal from the site. 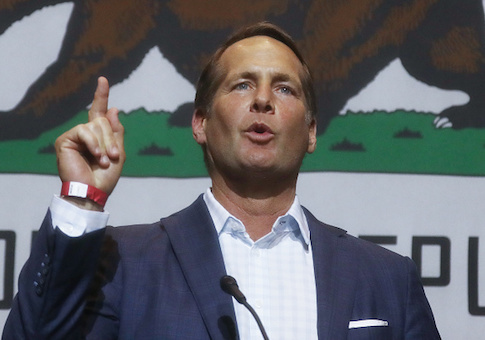 "Harley Rouda campaigned in the primary like he was running on the Socialist ticket with Bernie Sanders in Vermont," said Dale Neugebauer, Rohrabacher's campaign spokesman. "You can't sell that to general election voters in Orange County, California, so Rouda and his progressive allies are scrambling to erase any trace of the looney left-wing rhetoric he used to woo Democrats in the June election." Rouda's campaign also did not respond to inquiries on his positions stated on the questionnaire. The race for the House seat in California's 48th congressional is considered a statistical tie, according to Real Clear Politics.